With more than fifteen years experience as a trainer, Josh Kielwasser opened Infinite Iron in the Fall of 2010. He wished to address the need for a more refined approach to improving fitness and wellness. Operating inside Ypsi Studio seemed like the perfect partnership and it is a great pleasure to call this place home. Infinite Iron exists to enrich the quality of life of everyone it touches by building client relationships, constructing customized programs and keeping a fun and upbeat environment. We operate our business with honesty and integrity, strive for excellence in every aspect of the company and always look to improve ourselves and our services. Josh has long been interested in sports, training and fitness. He has competed in football, track and field and powerlifting as well as many other recreational sports. These experiences have made him well suited to assist with sport specific training. Over the years Josh has overcome multiple injuries, including a torn ACL which he rehabilitated through a self-designed regimen in addition to his prescribed physical therapy. As a result, he is able to help clients by applying this knowledge to their program design. 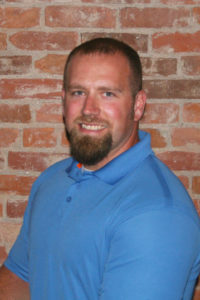 Josh’s education focused primarily in management, wellness, health and injury prevention. In a weightlifting class, Josh helped students develop a training regimen and his instructor took notice. The following semester Josh led the class as a teacher’s assistant and a hobby turned into a passion. Since that time Josh has trained at two other fitness studios and is excited to bring his experience and enthusiasm to this venture. His passion for health and fitness, paired with his knowledge and natural ability to teach proves this career is a perfect fit. Through his understanding of exercise program design and nutrition plans Josh’s motivation is sure to help you reach your personal fitness and wellness goals. Sessions by appointment, Monday through Saturday. © 2017 Infinite Iron. All Rights Reserved.